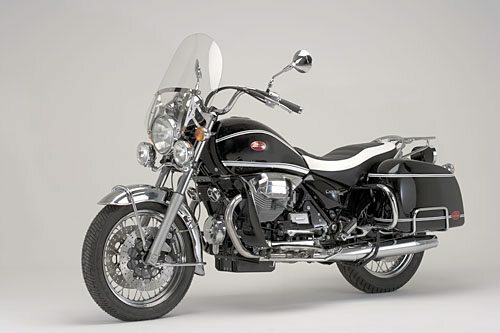 Moto Guzzi announced the California Vintage touring motorcycle, the newest in a line that stretches back 35 years to the original V7 California, introduced in 1971. The California Vintage is, by design, reminiscent of the Moto Guzzi California Police motorcycles used by ( you guessed it) California Motor Officers in years gone by. It has the perfect blend of retro and modern; it seems perfectly proportioned and it’s got loads of style. This should be a huge hit for Moto Guzzi if and when it comes to the U.S.A.
No sales plans or prices have been announced, but U.S. sales are a near certainty. Following is an edited version of the California Vintage information released by Moto Guzzi, followed by more photos and the technical specifications. We’ll keep you posted as we learn more. The California Vintage uses Moto Guzzi’s 1100cc 90° V-Twin, which is the company’s signature design. Apparently, the engine components in the California Vintage have undergone a redesign, lowering their weight and improving efficiency. Connecting rods and pistons have been made lighter and the ratio between rod length and piston stroke has been improved to reduce inertia and vibrations. 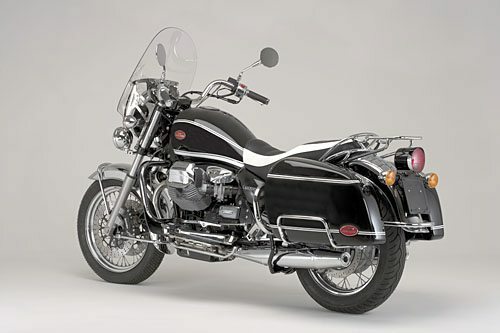 Moto Guzzi claims that touring will be made more pleasant, helped also by the modifications made to the valves. The sintered guides guarantee constant tappet gap and the Nymonic exhaust valves offer increased resistance to high temperatures and wear, extending the working life. The timing system is entrusted to the well-proven and reliable solution of mechanical tappets (not sure why Guzzi uses hydraulic lifters in some of the new bikes and not others), the alternator has been upgraded from 300 to 350 watts and the flywheel has been modified. The construction of the crankshaft has been changed to achieve greater efficiency in terms of sliding and lubrication. The brakes use the distributed linked system. The reference to the past is obvious in the spoked wheels, in the newly-designed steel mudguards (love those! ), in the new Brembo front calipers with black finish and in the supplementary fog lights, controlled by a switch on the right block. 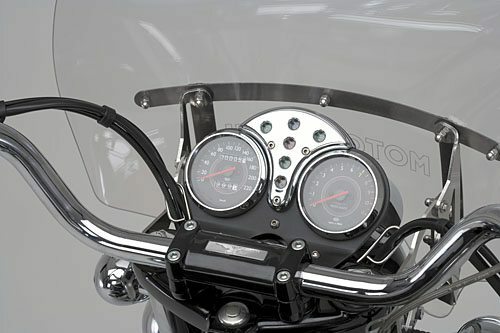 In this model, attention is paid to the smallest detail – the windshield is decorated with a stainless steel strip and both the handlebar and two-tone seat are exclusive to the model. 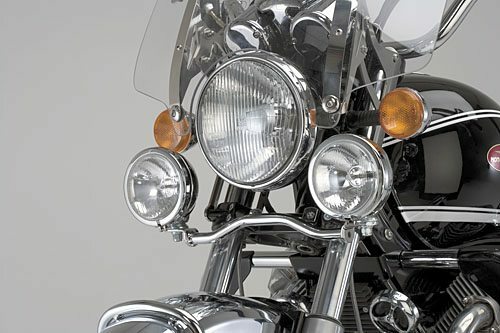 The classic engine is protected by chromed steel tubes with integrated. The special bags are fixed, made from rotational nylon, waterproof, lined and again protected with chromed steel tubes. The luggage rack is also chromed for a high-class touring look. While externally the California Vintage retains the same unmistakable look which brought it success throughout the world, technically it has been profoundly changed over the years and for the 2006 season it has undergone radical treatment. The engine has been almost entirely imported from the Breva 1100, with a considerable improvement in performance. The heads, cylinders, conrods, pistons, sintered valve seats and guides and Nymonic exhaust valves come from the Mandello del Lario model and inherit its power characteristics. The alternator has also been improved and the flywheel is new. Combustion is more efficient thanks to the twin spark cylinder heads, while the timing system is entrusted to the well-proven mechanical tappets. Other minor technical modifications include the new throttle body guards and cableways between the cylinders and tank. As far as the mechanics are concerned, the braking pressure distributor has been modified to improve efficiency. More powerful, easier to ride and safer, the look of the California Vintage has also been radically changed. Valve timing Intake open 96° B.T.D.C.